FOR A COMPLETE LISTING OF GENERAL PIPE CLEANERS PRODUCTS CLICK HERE TO TAKE A LOOK AT THEIR PRODUCT CATALOG. Quicker than conventional copper tubing cutters, the AutoCut™ is a great tool to have when you don’t have enough swing room to use a full size tubing cutter. You can cut copper tubing with less than one inch of clearance. Or you can easily handle close stub-out work. Just snap it on the tube, close the gate and turn. 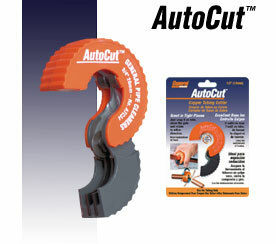 The cutter wheel automatically tightens as you turn the AutoCut - no knobs to twist. 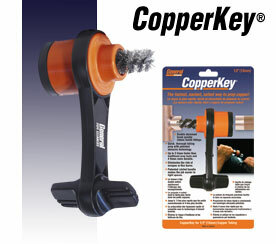 The ideal tool for copper preparation work, the CopperKey™ cleans copper tubing and fittings in seconds. The patented ratchet handle lets you work in really tight places where there isn't enough swing room to spin the handle. Just two or three inches of clearance are all you need to prep tubing inside and out. 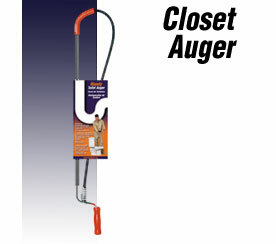 Closet Augers are the choice of plumbers and maintenance personnel for clearing clogged toilets. General offers four models. Our Professional closet auger features dual layer inner core to resist kinking while providing the right amount of flexibility. All are supplied with tri-lingual display card and instructions. A cleaner way to clear clogged drains. The Spin-Thru™ and Clog Chaser™ contains a 1/4” (6 mm) spring that’s fed out of the drum into the line, keeping it away from clean kitchen and bathroom surfaces. Available in professional metal containers or less expensive plastic. 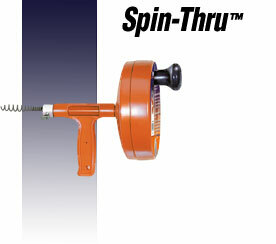 The power spindle option lets users add an electric drill. Supplied with tri-lingual display card and instructions. For kitchen, bathroom, laundry drains, and lines up through 3" in diameter. 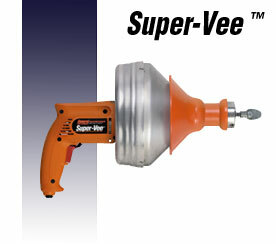 The Super-Vee has a patented Slide-Action Chuck built right into the grip shield. Just slide it back to grip the cable; forward to release it. Automatically adjusts for different size cables. With power cable feed - works great in tight spots. 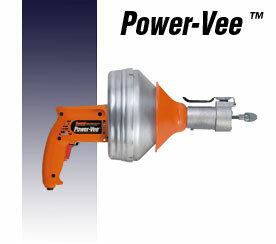 In tight or awkward places, the Power-Vee is like having a third hand. To feed the cable, just start the Power-Vee and squeeze the feed lever. To retract it, reverse the motor and squeeze the lever. It feeds 3/8" cables at 16 ft. per minute. Open clogged drains with shock action. A burst of compressed air creates a shock wave (kinetic energy) that travels through water to break up a stoppage. 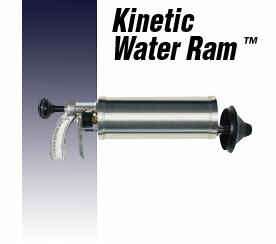 The Kinetic Water Ram quickly opens clogged sinks, toilets and tubs; handles rust, grease, and scale in lines up through 4" in diameter. Gives you light weight with a long reach. 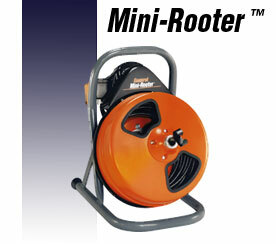 With 75 feet of 3/8" cable and a 1/3 hp motor, the inexpensive Mini-Rooter clears lines from roof top to basement. You can do heavier work in 4" lines when the machine is equipped with 1/2" cable. For inside jobs from 2" thru 4" in Diameter. 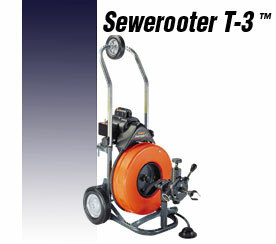 Ten inch wheels and a tall handle make the Sewerooter T-3 an easy machine to move around. Drum holds 100 feet of 1/2" Flexicore cable. Power cable feed gives you an easy way to feed cables, driving them into the line and retracting them without reversing the motor.